Today Olympus announced a new compact DSLR called Olympus E-450. The E-450 is very similar to the E-420, but has a few improvements including 3 new art filters, a new TruePic III+ processor, improved continuous shooting buffer (8 RAW-files instead of 6) and an improved LCD screen. The Olympus E-450 will be available in May 2009 and cost about $700 which include the kit lenses Olympus ED 14-42mm f3.5/5.6 and ED 40-150mm f4.0/5.6 Zuiko. CENTER VALLEY, Pa., March 31, 2009 – Olympus announces its new entry-level digital single lens reflex (DSLR) camera, which is small in size and powerful in creativity. The new E-450 continues the E-400 series’ heritage of a small and portable design, powerful features, and ease of use for any skill level, including first time digital camera users. Thanks to Art Filters pioneered with the E-30 and E-620, the E-450 provides consumers with the creative freedom to capture their images in new fun and exciting ways. The three Art Filters – Pop Art, Pin Hole and Soft Focus – bring greater creativity and freestyle experimentation to the new E-450. The creative filters were first introduced in Olympus’ E-30 prosumer DSLR earlier this year, and now enable consumers to express themselves and capture it all – limited only by their imagination. The E-450 offers the 10-megapixel imager and other features from the E-420. Olympus is scheduled to launch the E-450 DSLR on leading multimedia retailer QVC® Saturday, May 9. The product will be widely available in the U.S. and Canada in July. Art Filters are easily activated with the mode dial on the right side of the camera body. The effects are viewable right on the new camera’s 100 percent accurate 2.7-inch Live View LCD when using the E-450 in Live View mode or when reviewing the captured image. Olympus was the first to bring Live View to a consumer DSLR (the E-330 in 2006), and Live View has revolutionized DSLR photography. Anyone who has photographed young children knows that you get the best reactions when you hold the camera away from your face and maintain eye contact and an engaging smile. If you have tried to take photos high above the heads in a crowd or low near the ground, you will appreciate that it is easier to use the LCD screen than to climb a ladder or lie on the ground. The E-450 solves these problems with its Live View LCD, which enables photographers to easily and comfortably hold the camera at angles that could not be reached by using the optical viewfinder alone. The E-450’s Live View autofocus functionality now simplifies the process by working just like a point and shoot. By simply pressing the shutter button halfway, your subjects come into focus on the LCD, so when the perfect moment occurs it is easy to capture sharp images. A camera this consumer-friendly is perfect for taking portraits of friends and family while out and about. The E-450’s Face Detection feature distinguishes between people’s faces and the background. It tracks up to eight faces within the image area and automatically focuses and optimizes exposure for sharp, brilliant portrait pictures. Even if your subjects are moving, the camera continuously tracks their faces. Shooting scenes with shadows can be tricky because of the extreme contrast between dark and bright areas. The E-450 addresses this challenge with Shadow Adjustment Technology that compensates for extreme contrast when shadow areas are underexposed and lack visible detail. Now users can preview and capture images with the same fine contrast they see with their own eyes. With 18 pre-set scene-select modes for every imaginable shooting scenario and full manual controls, the E-450 offers a world of possibilities to photographers. Additionally, Perfect Shot Preview enables users to preview and select various photographic effects on a live, multi-window screen on the LCD before snapping the shot. This feature shows photographers what their images will look like beforehand under various settings, ensuring that they capture exactly what they want. It is an ideal way for novice users to learn about the effects of different photography techniques, such as exposure compensation, white balance and metering. Capturing, enlarging and displaying amazing images on your wall is a snap thanks to the E-450’s 10 million pixels for high-resolution photos. The 10-megapixel sensor gives users the flexibility to enlarge prints to the sizes supported by many of today’s printers, or crop the image to print only a part of the image that is important to them. The high-performance Live MOS image sensor in the E-450 delivers excellent dynamic range for accurate color fidelity and a state-of-the-art image processor dramatically reduces noise and captures fine image details in the highlight and shadow areas. Many digital SLR users want to focus their attention on things other than white balance while they are on the move. As a result, the E-450 features an improved automatic white balance performance with a new algorithm for more accurate color. Olympus’ TruePic III+ Image Processor produces crystal clear photos using all the pixel information for each image to provide the best digital images possible for every photo with accurate color, true-to-life flesh tones, brilliant blue skies and precise tonal representation in between. TruePic III+ also lowers image noise by one step to reduce graininess in images shot at higher ISO settings, enabling great results in low-light situations. Worried about missing the winning goal at the soccer game? The image processor on the E-450 enables it to shoot up to 3.5 frames per second in sequential shooting mode, which means that photographers will be able to capture fast-paced action as it happens. Life moves too fast to spend time worrying about dust ruining your images. Olympus’ proven Dust Reduction System produces spot-free photos with the exclusive Supersonic Wave Filter™. The patented ultrasonic technology vibrates to remove dust and other particles from the front of the image sensor and captures it on a special adhesive membrane every time the camera is turned on. This results in beautiful images free from dust spots, which could ruin or be distracting on an image. Accepting both CompactFlash Type I & II, Microdrives, and xD-Picture Cards, the E-450 provides a choice of data storage options for enhanced flexibility, and it is possible to transfer image files from one card to the other right inside the camera. If you decide to venture into the arena of advanced lighting, the E-450 is ready to meet the challenge. The E-450 is compatible with the Olympus FL-50R and FL-36R wireless electronic flashes that are designed exclusively for digital photography. When these flashes are used in combination with the E-450, wireless multi-flash photography is possible. The E-450 can control up to three wireless flash groups independently, with several flash units per group. 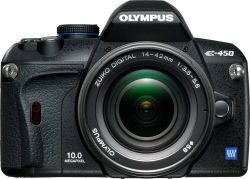 The Olympus E-450 DSLR will be available in July 2009. It includes E-450 Body, ED 14-42mm f3.5/5.6 Zuiko Digital Zoom Lens, ED 40-150mm f4.0/5.6 Zuiko Digital Zoom Lens, USB Cable, Video Cable, Li-Ion Battery Pack (BLS-1), Li-Ion Battery Charger (BCS-1), Shoulder Strap, OLYMPUS Master 2 Software CD-ROM, Manuals and Warranty Card.